Dreams hinge on financial security, so we help determined, creative people move themselves from jobs that barely allow them to survive to careers that allow them to thrive. If you’re interested in a personal, adult-oriented impact that pairs with a small but burgeoning social enterprise, Ilizwe Empowerment is the program for you. It began with a small gathering of residents of Molly Blackburn, an informal settlement in Nomathamsanqa, South Africa. That first day in 2015, the residents shared their hopes: a nursery school for Molly children, brick and mortar homes, clean water, electricity, enough food to feed their families, and a decent-paying job. All those dreams, however, hinged on financial freedom, so the residents started experimenting with beading: simple bracelets at first but then other crafts - such as crocheting, sewing, knitting. With each new skill, their confidence grew. They began to see themselves as capable in ways they had never imagined. The next steps were first to settle upon a name, Ilizwe, which means land in Xhosa, symbolizing a shared purpose on this small Earth, and second to register as an official organization. With the support of the Mayibuye Ndlovu Development Trust and SMTAX, that dream will come to fruition in early 2019. From an idea to experimentation to hard work, these inspiring Molly Blackburn residents have learned that change can happen, and that they can and should and must direct their own futures. This is a beautiful day! If you’re interested in supporting this initiative by becoming a sponsor, click here. Your sponsorship investment will be used to assist the crafters on the educational side, by considering career-training opportunities that will guide them through the essentials of running a business, such as budgeting, marketing, quality control, and more. Ilizwe, however, will be responsible for its own procurement of supplies and projects, a sign of their burgeoning commitment, pride, and independence, and of our belief in their abilities. I was born in Addo on December 10, 1968, and I grew up in the neighborhood of Molly Blackburn in Nomathamsanqa. I am raising four children, including a child of my sister, who passed away from cancer a few years ago. Currently I live in a shack, but I want an RDP house from the government. I am a Xhosa, and as black people, we have our traditions. We wear the special cultural clothes when we are burying our loved ones, and after they are gone, we remember their assistance. We slaughter the goats and the cows to remember our sisters. I had never crafted before. Now my life has changed, because I know how to do pillows and bracelets and more things. I love it, and I want to know more about handiwork. I am so lucky to be part of this project, because I learned about sharing, how to share with people. I also like that I can do something that other people like, that they can accept it. I want to help other people and teach other people, too. My dream for this project is that one day it will be bigger than it is, so I can earn more money and move out of my shack into a real home. I was born in 1973 in Addo, South Africa, and live in Molly Blackburn. I really like living here, because everyone feels like family, and I get a real sense of community. I have two sons: one 13 years-old and the other one 18 years-old. I have no father now, because he passed away in 2013. I work, but only during the picking season. When the season is over, I do not make an income. Those months can be difficult, because we still have to provide for our families. Learning to craft has changed my life, because I believe that eventually I will be able to make an income all year and not just seasonally. Then I will not worry as much. I will have less stress. I like working with beads, and learning to sew and knit. I am able to do more crafts than I thought. We are more creative than I first knew. I now know that things can be learned - that if I do not know how to do something, I can learn. We just need to be taught. I know this program will grow bigger. My life dream is to go to school and finish my studies. I would love to become an educator, to learn to teach children. I was born on February 24, 1984, in the Eastern Cape of South Africa. Now I live in Molly Blackburn in Nomathamsanqa with my mother, and I also have four siblings. I love my community of Molly. Although we do not have houses, and we all live in shacks, my neighbors and friends are kind and supportive. We have fun. We laugh. We joke. We also work hard. At first, I did not know how to do any of what we do now. Now my favorite projects are beading and making Molly’s Dollies. I would like to learn more about sewing. I believe this crafting initiative will grow and be much bigger. Ten years from now, just wait. This project will help me with my biggest dream: to have a home of my own someday. I cannot do that now, because I am a seasonal worker at a citrus pack house. That means that I help package up oranges and lemons before they get shipped. The problem is that seasonal work means I am unemployed for most of the year. This project will eventually help me buy food for everyone and for myself. I was born on August 7, 1993, in Nomathamsanqa, Addo. I moved to Molly Blackburn in 2009. Before that, I was staying with my granny, but when she died, I moved to Molly. My mother has four kids, and I am the second child. I am Xhosa, and I am proud of being Xhosa. I love my culture: the dancing, the traditional ceremonies, the singing. At first, I was scared about this project. I kept saying to myself, I can’t do this. I can’t do this. I had never done anything with my hands. I told myself that I would try. I would try to do these things and other things with my hands, like sewing. It was hard, but I can do it if I believe in myself. I would use my knowledge. Now I am proud of myself. I can even teach others how to make bracelets. Those are my favorites. I cannot wait to see my things selling. With the money, I will buy groceries, clothes, and airtime, and I will get my hair done. I am glad we are being given a chance to become bigger and more successful so that one day I can afford to stop working citrus. I was born in South Africa on January 17, 1998, and I now live in Molly Blackburn. I love my community, because they are hardworking, kind, and supportive. I live with my mother, my sister, and the child of my mother’s sister. Right now I have a job at the SRCC, a citrus company. I work only a few months a year, because it is seasonal work. We work when the reason is right, but the other months can be difficult. I found out about this project through my mother Nombulelo, who was one of the first to start experimenting with beads. I have been learning now for about two years, and I know have a lot of different types of skills that I didn't know beforehand. My favorite project has been beading the bracelets. I love this project because it will help me support myself. When it grows, I will buy food and save money for school. My dream is to be an electrical engineer and to have my own house someday. I know some people laugh at my dreams, but they will not stop me. I will work hard, study hard, figure out what I do not know, and make it happen. I am more confident now that it will be true. The crafters started small, with simple bracelets, but then they taught themselves how to make crocheted hats, and then Molly’s Dollies, and then beaded greeting cards, devices to air-dry lingerie, dresses, scarves, and more intricate bracelets. It was crystal clear, early on, that the crafters were driven. 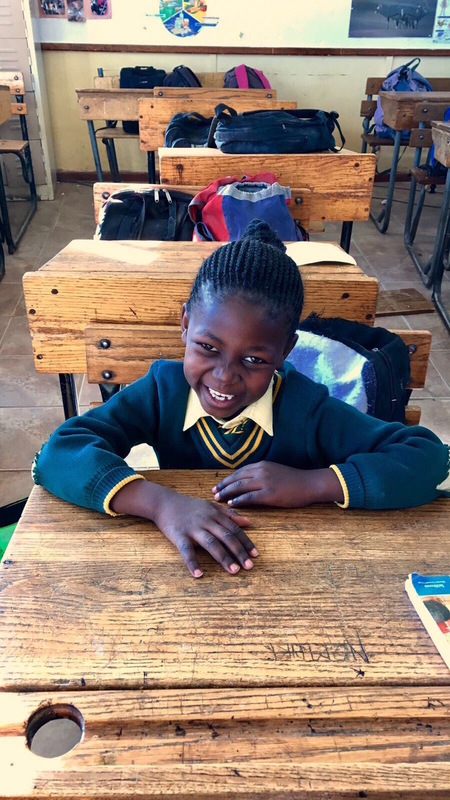 Early on, the sponsors' monthly donations provided the women with anything from beads to fabric, scissors to rulers, and sewing lessons to business workshops with Xhosa experts. Sponsor dollars also funded crafter participation in classes in creating, pricing, merchandising, marketing, accounting, and inventorying. Now that the group is primed to form an official organization, Ilizwe Empowerment, sponsor donations will fund professional development/education, but the group will be an independent entity, in charge of its own vision and progression toward financial freedom. "If I was in a personal financial crisis, and I could not feed my child, I could no longer pay for their school supplies for them to go to school, I didn't have enough money for them to ride the bus, whatever, and somebody from some other nation came in and said, 'Hey, you know what? We've got a solution. What we'll do is we'll set up a house where all the kids that have that problem can come live. They are not going to be your child anymore. You're just gonna have to give them to us, but we will make sure they have everything they need.' Is that the solution that you'd want? I think most honest people would say, 'No, I wanna raise my own child. I just need a job.'"